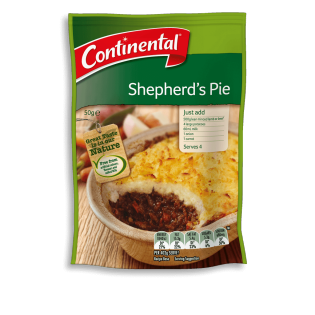 Creating authentic shepherd's pie has never been so easy with the help of this Continental fast and simple recipe base. Learn how to create this dish here. Wheat flour, corn starch, maltodextrin (from wheat), salt, burnt sugar, onion powder, soy sauce powder (contains wheat), natural flavours, sage, yeast extract, sunflower oil, pepper, garlic extract. Just add... 500g lean minced lamb or beef 4 large potatoes 60mL milk 1 onion 1 carrot Preparation time: 15 minutes Cooking time: 40 minutes Simply... 1. Preheat oven to 200˚C. 2. Peel and chop 4 large potatoes and boil until tender, drain. Mash potato with ¼ cup (60mL) milk and 1 tablespoon (20g) Flora spread. 3. Heat 2 teaspoons oil in a medium saucepan or frying pan and brown 500g lean minced lamb or beef and 1 chopped onion. Add Recipe Base, 1 cup (250mL) water and 1 diced carrot; stir to combine. Cover and simmer for 10 minutes or until carrot is tender. 4. Spoon into an ovenproof dish; top with mashed potato and bake for 20 minutes or until golden brown. Serve with green vegetables. Here's an idea... Top with grated cheese before baking.